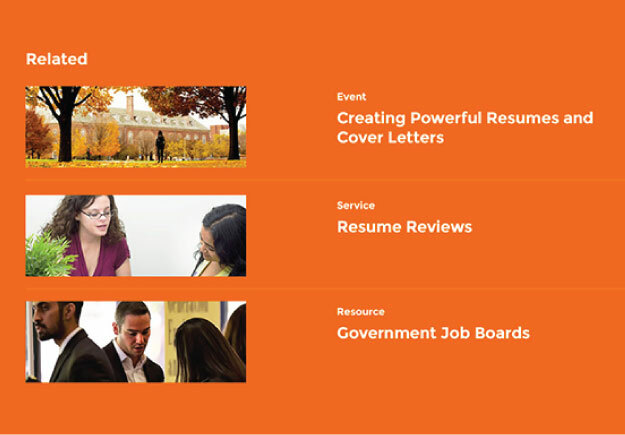 The Career Center website is a full-service tool for Illinois students to consider their career and to prepare for each step along the way to getting a job. College students don’t come banging down the door of the career office. Still it’s essential to get them to face the realities of entering the job field while they are still in school. So when Illinois students arrive at the Career Center site, they are met with an action plan. Critical in informing our approach was the deep knowledge and appreciation of the needs of their audience that the client team had. The site is a comprehensive resource that begins with considering a career, prepares students for each step of applying for a position, helps them line up interviews, and will even help get them dressed for their meeting. Really! To share the activities in the office with a dispersed student body, events on the website are fed by on-site scheduling system. The Career Center is held in high regard among its peers. So beyond the usability and completeness of their site content, the site dedicates space to sharing The Center’s approach to research, assessment and strategies. On a special section of the site they maintain a blog and a growing body of resources dedicated to this subject.